2 Corinthians Day 27 - Have We Mishandled the Word? 4:2 But we have renounced the hidden things of shame, not walking in craftiness nor handling the word of God deceitfully, but by manifestation of the truth commending ourselves to every man’s conscience in the sight of God. As we've mentioned before 2017 marks the 500th anniversary of Martin Luther nailing his 95 theses to the church door in Wittenberg. Born and raised in religion Martin began studying the Bible that was supposed to be the foundation of all he had been taught and now as a young priest was teaching others. As he began to read he soon discovered some major contradictions. Foremost was the issue of guilt and shame. Martin felt guilt and shame. He knew he was far from perfect. Some today are so tortured by guilt and shame that they want to cast off the entire idea of sin. They want to believe sin is a human construct and if we get rid of the entire idea the guilt and shame will be gone with it. It's not quite that simple. When we do things that hurt other people you can refuse to call it sin or even refuse to define it as wrong but the guilt and shame will still come. When Martin was a young priest in Germany his church had solutions for guilt and shame. You confessed your actions to a priest and he gave you a list of things to do to pay. Guilt and shame were to be paid away. It was a lucrative system for the Church but Martin was a priest and it was doing nothing to absolve him of his own guilt so how could it help anyone else? In fact religion had become so corrupt in Martin's time that people were paying in advance so they could commit the sins they wanted supposedly guilt free. They called these payments indulgences. Pay up then indulge. Martin wasn't sure what was right or true but he knew something was way off so he began to read the Word. In it he found an entirely different Story. Guilt and shame were not to be paid for, the actions that caused them were to be forgiven. In fact they already were. Martin and the entire religious system he was part of were trying to pay for sins that were already forgiven. The solution was forgiveness, not cash and just like that Martin was free and in a fairly short period of time the entire religious system was turned upside down. What made the difference? A true reading of the Story rather than the deceitful mishandled version taught by the Church. 4:1 Therefore, since we have this ministry, as we have received mercy, we do not lose heart. 2 But we have renounced the hidden things of shame, not walking in craftiness nor handling the word of God deceitfully, but by manifestation of the truth commending ourselves to every man’s conscience in the sight of God. What ministry have we received? Is it not the ministry of mercy? I have been accused recently of cherry picking the parts of the Bible that make God look good and skipping over the parts that make Him look bad. Specifically God told Moses to essentially step aside so He could let His rage burn the rebellious Israelites to a crisp in the desert for dancing around a golden calf. It is true that God spoke those words (more or less) but there is much more to the story. In the New Testament Jesus was traveling with his disciples in Sidon. A woman came begging for Jesus to help her sick daughter. Jesus flat out ignored her. For a while the disciples said nothing either but the woman was persistent and kept asking and asking. Finally the disciples had had enough and one of them blurted out "Master send her away, she is annoying!" At this point Jesus stops pretending she doesn't exist and tells the woman He is only here for the Jews, not for Gentile dogs. Not the words you would expect to fall from the lips of Jesus but they were a pleasant sound to the disciples. Finally He was getting his priorities straight. Then the woman responded in a most gracious way. "Yes, but even the dogs eat the crumbs that fall from the Master's table..."
"Woman" said Jesus, "I have not seen such faith in all of Israel. Go in peace, your daughter is well." A surface reading of the story is confusing just as a surface reading of the aftermath of the golden calf is confusing. Is God enraged or abounding in mercy? Is He racist and prejudiced or does He love all people the same? Could it not be that in both stories the words from God we're simply echoing the thoughts of His audience? In so doing was He not trying to help them see how ugly and wrong those thoughts were? Haven't you ever thought something and then when you began to hear the words tumble out of your mouth you immediately were struck with how awful they were? If Jesus really thought the people of Sidon were dogs why was He there to begin with? If God really wanted to consume Israel in a fit of rage did He need Moses to step out of the way first? It was the disciples who found the woman annoying. It was they who felt all Gentiles were dogs. Jesus just wanted them to see the ugliness of their hearts before demonstrating the mercy in His. For anyone with an unveiled face, His mercy is beyond evident. We are still here aren't we? God stood back while we killed His Son and still extended us His mercy. What more evidence do we need? And where do we get off thinking that after such a limitless, boundless, extravagant display of unconditional love we have the right to withhold mercy from others, to "teach them a lesson" by making them wallow in their shame? We have been given the ministry of mercy. It is for us to renounce shame. To bring our brokenness out into the light and experience full healing for ourselves and our enemies in the recovery room of His grace. When sinners tangled up in shame come to any person who claims to be an ambassador of Jesus Christ they should see and find the same thing Moses found and saw when he was in the cleft of the rock - Mercy. 3:15 But even to this day, when Moses is read, a veil lies on their heart. 16 Nevertheless when one turns to the Lord, the veil is taken away. 17 Now the Lord is the Spirit; and where the Spirit of the Lord is, there is liberty. 18 But we all, with unveiled face, beholding as in a mirror the glory of the Lord, are being transformed into the same image from glory to glory, just as by the Spirit of the Lord. It was a painful time back then when Paul was living. The once proud Jewish nation was now in tatters. It wouldn't be long before the Romans would march in and destroy the temple pretty much ending any last bit of national pride and unity. The children of Abraham, the people of Moses, the kingdom of David, were a mere shadow of what they had once been. Under Solomon monarchs came from distant lands to see the splendor of his kingdom. Now they live under the thumb of Rome and a cloud of confusion. There was this guy who hailed from Nazareth. He gathered a following. John the Baptist announced Him as the Lamb of God who takes away the sin of the whole world. Not even His own disciples were sure what that meant at the time. As the months passed it became impossible to ignore Him. Lepers were being healed. Blind people were getting their eyesight back. The lame were walking, the mute were hearing and the dumb were talking. He even raised people from the dead. On the flip side He showed compassion to unclean foreigners, He respected women, He broke the Sabbath, and had ideas and teachings that just didn't wash with what the Jewish religion taught. In the end the tension boiled over and even though some felt He was the long awaited Messiah, the Seed promised through the line of Abraham, they killed Him. His followers opened to the leaders and the people the writings of Moses and the prophets showing that He was the Promised One but it was like they were the ones who were blind and deaf. Their traditions and ideas clung to them like leprosy and they could walk in the light that was blazing all around them. Decades later Paul wrote to the Corinthians that still some read the writings of Moses with the same veiled eyes. They just couldn't see the obvious. But. And there is always a but. But those who opened the door even a crack to let in the fresh winds of the life generating Spirit of the Lord caught a glimpse and that glimpse began to pulse within them. They were able to taste and see that the Lord is good. Just as Lazarus was raised from physical death and unwrapped and set free from the grave cloths that bound him, so does the life giving Spirit of the Lord set us free from every false idea that has bound us. That's the freedom Paul is talking about. The freedom to see God as He really is. To hear what He has been trying to say for millennia. To ascend the same mountain again yet catch an entirely new view of what we thought we already knew. Freedom to see, hear, think, process, understand, and embrace Him as fully as we can, only to discover there is more and yet more. If you are on that journey keep going. If it sounds foreign to you, open the door of your heart and let the fresh winds of His Spirit bring new life to your soul! 2 Corinthians Day 24 - Can I Get An Amen!?! 3:16 Nevertheless when one turns to the Lord, the veil is taken away. 17 Now the Lord is the Spirit; and where the Spirit of the Lord is, there is liberty. 18 But we all, with unveiled face, beholding as in a mirror the glory of the Lord, are being transformed into the same image from glory to glory, just as by the Spirit of the Lord. The veil. What veil? Read the gospel of John. Read it again and again. Did you see it? See what you ask. All of it. Did you see how Jesus talked about blindness so many times? Did you hear Him tell Nicodemus "Unless you are born again you will never see the kingdom of God"? Nicodemus the Jewish ruler and rabbi. Nicodemus who was supposed to help others see was himself blind. His eyes were veiled. But veiled by what? Matthew tells us when Jesus died the massive veil separation the two innermost rooms of the temple was torn from top to bottom. The most conservative estimates put the veil at 60 feet high and 4 inches (10cm) thick. Why? To expose something that had been true all along. To open to the Jews and the world the full extent of the Story that heaven had been trying to communicate to earth all along - the Lamb was/is Jesus. To expose to the universe the radical boundlessness of the love of God and His willingness to rescue us at any cost to Himself. Time and space prevents me today from unpackaging all of that from the rich symbolism of the Ark of His Testimony. That golden box which was the main feature in the movie Raiders of the Lost Ark, was the only thing in the innermost room of the temple. However since we're in 2 Corinthians we need to track with Paul. If you want more info on the temple and the ark let me know. For now Paul has a singular point. Some live with a veil over their eyes while others can see and the only difference between the two is Jesus. One day Jesus healed a blind man (one of several during His ministry). You can read about it in Mark 8. What makes that miracle unique is that it happened in two stages. The first time Jesus touched his eyes and he began to see, sort of. He told Jesus that the people looked like trees. His vision was blurry and undefined. Bodies looked like tree trunks. Jesus touched his eyes a second time and then he could see perfectly. Why? Did Jesus make a mistake? Was there not enough juice in His miracle fingers the first time? Hardly. Everything Jesus did was calculated. He was making a simple point. Sometimes the veil doesn't just vanish. Sometimes (maybe all the time) we regain our vision in increments. We learn to see as He sees in stages. Think about it. The disciples first saw Jesus as a good teacher, a good rabbi. Then they began to see Him as more although they weren't sure how much more. Could He be a prophet perhaps, even the long awaited Messiah? Then eventually they saw Him for who He really was, the Son of God. The veil comes off differently for each of us, that's why I believe Jesus never cured physical blindness the same way twice. Paul says this miracle of shedding the veil is a result of seeking after Jesus, and everywhere He is at work there is liberty, freedom, a breaking of every chain and a release from blindness in all its forms. Are you catching this? Do you see how good this news is?!! The more we see of Him the more we become like Him. The more we become like Him the more we see. It's an endless miracle of Him setting us free. 3:12 Therefore, since we have such hope, we use great boldness of speech— 13 unlike Moses, who put a veil over his face so that the children of Israel could not look steadily at the end of what was passing away. 14 But their minds were blinded. For until this day the same veil remains unlifted in the reading of the Old Testament, because the veil is taken away in Christ. 15 But even to this day, when Moses is read, a veil lies on their heart. 16 Nevertheless when one turns to the Lord, the veil is taken away. 17 Now the Lord is the Spirit; and where the Spirit of the Lord is, there is liberty. 18 But we all, with unveiled face, beholding as in a mirror the glory of the Lord, are being transformed into the same image from glory to glory, just as by the Spirit of the Lord. One of the great themes of the teachings of Jesus was seeing vs blindness. Paul picks up the theme here as he continues to work through the issues in Corinth. A man did something wrong. Who it was or what exactly he did is uncertain. We know a man there took his own father's wife. Whether it is him they are dealing with is uncertain. What we do know is that the man is sorry but the church won't let it go. To expose to them the error of their ways he uses a series of contrasting terms that we have looked at over the past few days. Yesterday we saw that rejecting a person in whom God is at work by His Spirit is to trample on holy ground. Today Paul continues that idea. Moses was being shown a side of God he never knew existed. When he had smashed the original tablets of stone in anger, frustration, and hopelessness he assumed their journey with God to the Promised land was over. In his mind God had given a list of requirements which they had agreed to and then promptly broken. The covenant or contract was now nul and void. But God threw him a curve ball. He asked Moses to bring two new tablets and come back up the mountain. He was going to write a new copy. The journey was going to continue. Moses was completely confused. How could this be? When he started to grasp that God was going to continue with them even after their sin, he blurted out "Show me your glory!" It was a way of saying "What kind of God are you?!!" When God answers the request Moses sees what he was blind to all along. God is "merciful and kind, slow to anger and abounding in love." In fact God was/is so much better than Moses thought that God could only show him as much as he could handle. In fact God basically said "If I showed you all of my goodness you would die." When Moses returned to the people he was still glowing but they turned from him. They asked him to cover his face. I have experienced this. More than once I have had religious people turn from me when I talked about how good God is. They said I talked too much about His love. That's the point Paul is making. In Corinth there was a time when they treated sin as no big deal. God says it is a very big deal. Now the pendulum has swung and they are punishing a man even after he has turned from his sin. In all of it they were blind to who God is. They have veiled faces. They are looking at the words and laws and rules but can't see the Lawgiver. They can't see that everything He has done and is doing is designed to bring them restoration and life. He says sin is evil because it is and it will destroy them. He doesn't want that. He also doesn't want us living under the cloud of past mistakes because His mercy endures forever. Are you still under the veil? Does your reading of the Bible and your religious life consist of dos and don'ts, or rules and regulations? Have you fallen into the trap of thinking Holiness will come to you and others by beating yourself and them with the whips of past mistakes? Are you afraid that if the wounds are allowed to heal through the balm of forgiveness that somehow you're cheating? If that sounds anything like you, flee religion and pursue Jesus. Climb the mountain again. Take a second look. 3:7 But if the ministry of death, written and engraved on stones, was glorious, so that the children of Israel could not look steadily at the face of Moses because of the glory of his countenance, which glory was passing away, 8 how will the ministry of the Spirit not be more glorious? 9 For if the ministry of condemnation had glory, the ministry of righteousness exceeds much more in glory. 10 For even what was made glorious had no glory in this respect, because of the glory that excels. 11 For if what is passing away was glorious, what remains is much more glorious. Paul is doing what Paul does best and if you don't know what he is talking about it sounds like a riddle. The reality is that it's very simple. In the Old Testament altars and sacrifices and later the temple and the priesthood all had glory attached to them. They had a level of sacredness. The Ark of the Testimony/Covenant was to be treated as holy yet none of it was. The sacrifices were to be understood as removing sin from the guilty but they didn't. They couldn't. They were just animals. All of it was symbolic. All of it was props in a type of living drama designed to point to something else. What Paul is saying is that if the system of symbols was glorious how much more glorious is the reality? What makes more heat - the sun or a picture of the sun? What provides more flavour and nourishment - a plastic decorative apple or the real thing? The answer is so obvious it begs the question as to why Paul is even wasting the time making the point? Here's why. The people were denying the work of the Spirit in their lives. They were treating Him as nothing. They were ignoring His counsel and guidance. Just as the Jews has turned the lesser glory of the temple into a moneymaking racket and a farce, so we're these baby Christians making a mockery of the work of the Spirit in the temple of their hearts and minds. He was calling them to forgive while they were healing endless guilt on a brother who was genuinely sorry for his sin. Who are we, who am I to deny the leading of God's Spirit? Who am I to send the forgiven on endless guilt trips? If the cold stone of the written law held glory even before we knew the heart of the Lawgiver, how much more reverence is due Him? How should I treat others knowing they are a Temple of His Spirit? Talk about glory... They weren't permitted to even touch the mountain when God was giving the law to Moses. How dare I touch my brother in any way that is out of harmony with God while God is giving him His Spirit? 3:6 God, who also made us sufficient as ministers of the new covenant, not of the letter but of the Spirit; for the letter kills, but the Spirit gives life. So many contrasting terms. What does it mean for us? When I was a kid a popular game to play at birthday parties etc... was a memory game. A bunch of small ordinary items like paper clips and nail clippers were placed on a tray and covered up. They would be uncovered for a minute or less and then the tray was taken away. One item was removed and the tray was brought back. You got to look for 30 more seconds and try and figure out what item was missing and write it down. This was repeated over and over until the tray was empty and then we found out who won by comparing our guesses to the order in which the items were taken away. Thirty seconds is not a lot of time to figure out and remember 20+ items. Not only that but the memory of what was there quickly got jumbled and/or began to fade as soon as it was covered again. Moses saw God's glory, His character of mercy and long-suffering goodness. However he only saw it briefly. He just caught a glimpse. It was amazing and so unlike anything he had ever seen or expected to see. The "ten commandments" were also a glimpse but we're tainted and continue to be tainted by our preconceived ideas. 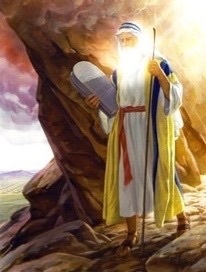 When Moses came back from seeing God's glory he was literally glowing and had to veil his face. It was symbolic of the fact the people could recognize something happened but they couldn't grasp it. My grandfather was in the war and it very obviously affected him deeply and we all knew yet we knew nothing of what he experienced. Soon the glow faded and the experience was but a memory written down but not understood. Then came Jesus. He was the glory of God in living colour. He was the ink made flesh, the writing on stone in the form of a real actual Person. The stones were cold and demanding. They painted an elusive picture that demanded rigid perfection. Anyone who took the words seriously was gripped by hopelessness. How could anyone be so perfect and what happens to those who fall short? It was indeed a ministry of condemnation and death. But then came Jesus and everything changed. He put a spotlight on the tablets of stone making them even more demanding. Adultery was lust in the heart. Murder was hatred in the heart. Who could reach such a standard?!! However at the same time that He lifted the standard so high He stooped to free a naked trembling woman from condemnation called for by her falling short of the letter of the law. He went to Samaria, the land of the 'half breeds' and offered living water to a woman who had been divorced five times and was living in sin. So brightly shone the glory that the religious leaders who knew only the letter that kills wanted Him dead. They were willing to do anything to snuff out the light. It couldn't be done. Here we are almost 2000 years later still amazed by the Light, still pondering how quickly and completely Jesus turned the tables upside down. The new found light that both Judaism and the Romans tried to snuff out is now the largest faith in the world and the only one that offers life where the letter demands death. There are laws. There is a very high standard. With man it is impossible but with God all things are possible and none of it can be understood in its beauty except through the glory of the person of Christ. Moses only got to see a fleeting glimpse. We have Jesus. No one can veil Him. He is our Righteousness. He is our Hope. He is our Life. For God so loved us, that He gave His only Son, that whosoever believes in Him will not be killed under the condemnation of the letters on stone, but will be given everlasting life by the Rock of Ages. 3:1 Do we begin again to commend ourselves? Or do we need, as some others, epistles of commendation to you or letters of commendation from you? 2 You are our epistle written in our hearts, known and read by all men; 3 clearly you are an epistle of Christ, ministered by us, written not with ink but by the Spirit of the living God, not on tablets of stone but on tablets of flesh, that is, of the heart. This of course is nothing new for Paul. In his writings we could probably find a page or more of similar contrasts. So why here? Why now? Yesterday I spoke of credentials and received some lively feedback in private message form which I appreciated. It made me see that I was as clear as I could have been. A couple of people felt it was an attack on education which was never my intent. What I believe Paul was trying to say is that his highest credentials (even though he was highly educated) were the lives changed as a result of his ministry. In other words the measure of man should not ultimately be his papers or the letters behind his name or his lack of such. There are some who would dismiss a person as unqualified because they are educated. There are others who would dismiss a person because they aren't formally educated. Both are unwise and wrong. More than once Paul claimed he was ordained as an apostle not by men but by God. Does this negate ordination? As Paul would say: "Heaven forbid!" He was indeed affirmed by the body. That just came later. Sometimes God is ahead of His people... (yes you can smile here). God is big on education. He educated Adam and Eve. They rejected His education and paid a price we are still paying. Now back to the contrasting terms. Do you see a pattern? One might say the first column of terms are concrete terms and the second more abstract. Others may express the differences as tangible and intangible. Still others may see or define it differently again. The real question is "What was Paul trying to communicate?" I believe the key word is sufficiency. Anyone can read the letters on the stone or the ink on the policies etc... and come up with some interpretation. Would they be right? Maybe. But if the writing is from God ought we not to ask Him what it means? Wouldn't we be better able to understand if we knew His heart and were lead by His Spirit? We can either be self-sufficient or make Him our sufficiency. This contrast applies to all of us whether we are formally educated as Paul was in all things Jewish or informally educated as Paul was in the reality of the carpenter from Nazareth. Had Paul not humbled himself and made Christ his sufficiency we would never have known much or anything about him. We all have access to the writings from the finger of God on stone tablets. We all have the ink on the pages of the Bible written by the prophets. We all have some kind of education. The great difference is in Who we make our sufficiency - self or Christ? 3:1 Are we beginning to commend ourselves again? Or do we need, like some people, letters of recommendation to you or from you? 2 You yourselves are our letter, written on our hearts, known and read by everyone. 3 You show that you are a letter from Christ, the result of our ministry, written not with ink but with the Spirit of the living God, not on tablets of stone but on tablets of human hearts. As the noble class grew and their families became too large to be sustainable without them doing some kind of work a problem became evident. How could these rich kids with no skills compete in the marketplace against peasants who had been plying their trades for generations? The solution? Universities. The nobility created a system where the educated got the jobs over the skilled and the only ones who could afford this education were of course their own children. Having formal education/certification trumped hands on education. Those who knew how were squeezed out by those with papers. My brother is a classic example in our times. My dad went to school and became a certified autobody repair technician. He opened his own business. My brother has natural giftedness and aptitude for it. He has been painting alongside my dad since he was twelve or less. It wasn't before he could paint better than my dad and my dad readily admitted it. To this day my brother has no formal education in autobody repair. If he wanted to work in that industry he would never get hired in a case where a certified person applied at the same time and if he did get hired he would be paid less even though he has years more experience and a higher level of skill than a young person coming out of school with an "education" and certification. I say all this as an introduction to Paul's words to the church in Corinth here in chapter three. Paul has no formal education as a minister of the gospel. He has no PhD, nor Masters degree. He doesn't even have a Bachelor's degree. Some in Corinth because of his absence and because of the divisions and problems are feeling justified in dismissing his counsel to them. Like restless teens they are trying to buck his authority. After all, who does Paul think he is? Paul asks the question: "Do I need to send letters of recommendation along with my advice? Or do I need you to give me a letter of recommendation? You are my letter." The proof that Paul is certified is in the results. His qualifications are proven by the track record of lives surrendered to Jesus. In simpler terms the proof is in the pudding. Would you prefer a man whose qualifications are proven by results or by papers? Ideally both is best but in the absence of one or the other I'll take the guy who has demonstrated his ability through tangible results. So it is in matters of faith. If you are struggling to know who to listen to in matters of faith look at their track record above the letters behind their name. Do the results match their title? None of the apostles were "educated" yet even their opponents could plainly see "these men have been with Jesus" and in the matter of faith there is no better education. 2:12 Furthermore, when I came to Troas to preach Christ’s gospel, and a door was opened to me by the Lord, 13 I had no rest in my spirit, because I did not find Titus my brother; but taking my leave of them, I departed for Macedonia. From what we can piece together of the story in Corinth based on 1 and 2 Corinthians and a few clues elsewhere, the church was upset at Paul because he had said he was returning and he didn't. Instead he sent Titus to deal with the problems while he felt called elsewhere. When God opened the way for him to preach the gospel in Troas it appears Titus was to meet him there and help but he never made it. So while Corinth was still lamenting the absence of Paul, he was missing Titus and struggling alone in Troas not knowing what even happened to Titus or if he was ok.
Paul ends this section giving praise to God for His leading and then gently corrects the church in Corinth by reminding them that he isn't out peddling the gospel for his own profit and comfort as some are. Instead he is out in the trenches often alone and lonely for the sake of Christ. As he preaches some receive it as life giving truth while others reject Christ and by extension reject him. I can't hold a candle to what Paul accomplished but I have some sense of his feelings. I have left churches behind and the people in them. No matter where I am I'm missing someone. I have felt the joy of bringing Christ to those who never knew Him before and felt the pain of those who reject Him. I have felt the isolation ministry can be at times. I have felt the pressure from those who felt I should be working differently or in a different place or felt they needed more of my time or presence. At the end of the day I sleep well knowing I'm not a peddler of the Gospel and that I'm not alone. The Great Shepherd sees all and knows all and is both before and behind us. Everything Paul is feeling or I am feeling Jesus experienced more deeply. Yesterday I had a talk with someone in great pain because she loves deeply. It reminded me of the truth that love hurts and the more deeply we love the more pain it causes. It made me appreciate Jesus on a whole knew level. He loved with a perfect love. I can't begin to imagine how painful that was for Him - the constant rejection, the questioning of His choices, motives, and actions, even by His own disciples. In all of it His love never faltered. Paul has had a rough time with Corinth but his care and concern remained constant. "Love never fails". 2:7 so that, on the contrary, you ought rather to forgive and comfort him, lest perhaps such a one be swallowed up with too much sorrow. 8 Therefore I urge you to reaffirm your love to him. 9 For to this end I also wrote, that I might put you to the test, whether you are obedient in all things. 10 Now whom you forgive anything, I also forgive. For if indeed I have forgiven anything, I have forgiven that one for your sakes in the presence of Christ, 11 lest Satan should take advantage of us; for we are not ignorant of his devices. Perhaps of everything we have discussed on the subject of forgiveness, this is the most important. Paul's​ concern for the church in Corinth was that they couldn't seem to stop the punishment phase. Like many of us they likely feared that if they "let it go", they would be saying the man never did anything wrong or that it wasn't a big deal, or would be opening themselves up to have him repeat whatever he had done. Paul had a very different concern. His concern was that the man would never recover and would suffer under the cloud of guilt and shame forever until he gave in to hopelessness. Paul's concern was based on the fact the man was truly sorry. Paul said he had sorrow, sorrow that could potentially consume and destroy him. Think about Peter. What would his future have been after the cross if Jesus didn't release him from the guilt and shame of his denial? However, and this is a huge however, what about cases where there is no sorrow? What about cases like the man in Jesus' story who gladly received forgiveness but than coldly threw another man in debtors prison? How do we relate to such a person? I have one word - boundaries. If you lend to someone who promised to repay but doesn't, don't ever lend to them again. Forgive them but maintain that boundary. When Adam and Eve sinned God pursued them. He initiated the healing process. He promised a solution, but He also erected a boundary. When Jesus was here He had boundaries. It came to the point where he stopped going to Jerusalem because they were so resistant against Him. Enabling offenders to offend by blindly putting ourselves in the position to have them reoffend is not something God ever called us to. It is not even love. When God describes heaven to us in His Word it is described using boundaries. It has walls. It has gates. He said "Nothing that defiles will enter there". People who offend but feel no sorrow need to be left alone to feel the effects of their choices. God also said "Those I love I rebuke and correct." The obvious question is "Where is the forgiveness in that? I thought we were always to forgive, even 70 x 7 times." Yes we are. Even when they aren't sorry we forgive but we don't position ourselves to help them reoffend. The same Paul who said to comfort this man who had sinned told them in the last letter to have nothing to do with the man who took his father's wife. That's boundary language. Here's the bridge. All correction and punishment that is Godly is motivated by love. It has restoration in view. It is seeking the best possible outcome. If someone hurts me but is sorry (like Peter when he denied Jesus) I need to take the first step and initiate the healing process by forgiving them and treating them as if they never sinned. If someone hurts me and is not sorry, I need to forgive them within myself but erect a boundary. That means within myself I long for their restoration, I pray for them, I even find ways to help them succeed in positive directions but never do I compromise the boundary until it is clear they are feeling sorrow for what happened. Until then it is unsafe and unloving to treat them as if what they did was ok or no big deal. Ask God for wisdom. Love must always be our motivator. Healing and restoration must ever be our goal. The path to get there will vary depending on them. I hope that makes sense. I welcome your feedback. Paul says we need to forgive. Jesus in answer to Peter's question about how many times we should forgive told a story of the radical boundless forgiveness of the king contrasted with the petty unforgiveness of one of his forgiven subjects. We then looked at how the king responded to it. The question we ended with was "Do we have the right to withhold or withdraw forgiveness from someone who abuses our forgiveness like the king did?" The short answer is no. The long answer is boundaries. Let's look at the story again. The king is God. The man who owed the impossible debt is every one of us. The man who owed the small debt represents the small offenses we commit against each other which in comparison to our life sum of offenses is very small. The servants who observed the unfair treatment and reported it to the king are people like you and I who witness injustice but are powerless and/or not in a position to do anything about it. They did the only thing they could do. They left the matter with the king. Now let's look at all this from a legal standpoint. When the forgiven subject had his fellow subject tossed in debtors prison he did nothing wrong. He was within his legal rights. The man owed and couldn't pay and the law said that unpaid debts could be settled that way. Technically no crime was committed. So why was the king so angry? Why did he withdraw his compassion and heap the man's debt back on his shoulders? The answer is in the prayer of Jesus that He taught to His disciples. "Forgive our debts as we forgive those who are indebted to us." See there are two streams of Justice. There are two kingdoms. There are two styles of government. Our life on this earth is lived with constant choices and those choices reveal which government we want. The kingdom of God is the kingdom of grace. He values restoration and relationship over revenge. Because of who He is, because of His character, His first foot forward is forgiveness. It is offered fully before it is even requested because His goal is to rebuild and restore. The other kingdom is Satan's kingdom. In his kingdom self is everything. The whole goal of everything is to rise to the top at all costs. Pride is supreme and if you hurt me you will pay. Can you see where unforgiveness comes from? It is pure self-obsession. So the guilty man under the impossible debt begs for mercy and without struggle or conditions receives it. Immediately he sees an opportunity to be more than debt free. Now he can "get ahead" by collecting was is owed to him. He will move from the extreme red into the black. He's thinking about no one but himself. The forgiveness he received is forgotten. He never thought for a second about what it cost the king. He fled from the kingdom of grace right back into the kingdom of self. Can you see now why the king was angry? It wasn't anger over the debt. It was anger over the trampling of grace. He had opened wide the gates. He had created an opportunity for the kingdom of grace to expand. It was all spit upon. Jesus was crucified all over again. Can you see it? When I choose to not forgive I am within my legal rights but not in the kingdom of grace. I am within my legal rights in the kingdom of self. If that is the kingdom I insist in operating under, no grace can be given there. In that kingdom the blood of Jesus has no place. No wonder the king was angry. What cost Him everything was treated as nothing and He was forced by the choice of the man to return him to the kingdom he preferred - the kingdom of self. In that kingdom you collect every debt owed you a d you pay every debt you incur. See the king didn't kill him. He just placed him under the debt again. Now he had to pay just as he demanded payment. No grace. No mercy. What was the torture? Easy. The guilt, shame, and oppressive burden of the unpaid debt. So do we have the right to withhold forgiveness from those who operate under the parameters of the kingdom of self? No. That is the King's domain. Report it to Him and leave it there. "'Vengeance is Mine' says the Lord." 2:6 This punishment which was inflicted by the majority is sufficient for such a man, 7 so that, on the contrary, you ought rather to forgive and comfort him, lest perhaps such a one be swallowed up with too much sorrow. 8 Therefore I urge you to reaffirm your love to him. 9 For to this end I also wrote, that I might put you to the test, whether you are obedient in all things. 10 Now whom you forgive anything, I also forgive. For if indeed I have forgiven anything, I have forgiven that one for your sakes in the presence of Christ, 11 lest Satan should take advantage of us; for we are not ignorant of his devices. This subject of forgiveness is avoided for the simple reason that it is painful. Satan has many devices and one of them is twisting our thinking and tempting us to look at things backwards or upside-down or from any perspective but the right one. When it comes to forgiveness the most common warped thinking is the idea that "If I forgive I'm saying what they did was ok." Nothing could be further from the truth. What we are doing when we forgive is starting the healing process. It is step one toward the offense never occuring again. It's not by any means a guarantee that healing will occur but not forgiving is a guarantee that it never can. It leaves an open would that can never be closed up for the offender or the victim. Now back to our story or rather Jesus' story. He told of a king that forgave an impossible debt only to have the forgiven man harshly throw another man in prison who owed him very little. When the king found out what he had done do you know what the king did? 18:31 So when his fellow servants saw what had been done, they were very grieved, and came and told their master all that had been done. 32 Then his master (the king), after he had called him, said to him, ‘You wicked servant! I forgave you all that debt because you begged me.33 Should you not also have had compassion on your fellow servant, just as I had pity on you?’ 34 And his master was angry, and delivered him to the torturers until he should pay all that was due to him. Maybe you are thinking "Wait a minute, the king is suddenly very unforgiving. What's up with that?" It's a fair observation. However to say the king is unforgiving is to deny the rest of the story. The king never intended to go back on his forgiveness of the man. He had extended grace full and free. The problem was the man never received it. It had no effect. Forgiveness is meant to break the cycle of guilt, shame, pain, etc... Love awakens love. In this story that never happened. Because it never happened the king was forced to resort to a much less desirable method, not to appease his own hurt, but to protect his other subjects from this cold hearted man who couldn't be won by compassion. Jesus is the king in the story and when you walk through His life here on earth there was ever only one thing that made Him angry - the mistreatment of others. He never got angry over things done to Himself. He got angry over pain caused to others, particularly by those in a position to know better. So does all this mean that I am free to refuse forgiveness to those I think should know better? Can I turn my back on those who have abused my compassion? 2:8 Therefore I urge you to reaffirm your love to him. 9 For to this end I also wrote, that I might put you to the test, whether you are obedient in all things. 10 Now whom you forgive anything, I also forgive. For if indeed I have forgiven anything, I have forgiven that one for your sakes in the presence of Christ, 11 lest Satan should take advantage of us; for we are not ignorant of his devices. Forgiveness. Easy to say. Then reality sets in. Yesterday I told you we would look at what Jesus said about withholding forgiveness. He told a story about a man who owed a tremendous amount of debt. It was an amount large that he would never be able to repay it. He was called to account. He pleaded for more time. He promised he would repay. It was an empty promise. They both knew it. The penalty for not paying was to have himself, his family, and all his possessions sold. The money still wouldn't pay the debt but it would be the end of the matter. The king looked at the helpless man drowning in an unpayable debt and his heart was moved with compassion. He decided to just forgive the debt. He wiped the slate clean. He didn't have to but he did because he could and he wanted to. The man left free of his burden. The fear of failing his family and potentially never seeing them again was lifted. The sleepless nights were over. He was free, pardoned by the king. On his way home he remembered a man who owed him the equivalent of ten or fifteen dollars. Peanuts. He went looking for him. Grabbing him by the throat he demanded payment or he was sending him to debtors prison. The man pleaded because he just didn't have the money but there was no compassion, no extra time, no mercy of any kind. Instead he shipped him to debtors prison. His servants found out what he did and we're horrified by his coldness. They reported the matter to the king. What do you think the king did? Why did Jesus tell this story? He actually told it in response to a question from Peter. Jewish custom was to forgive an offense three times and then mercy was over. Peter had been watching Jesus. He knew Jesus was more merciful than anyone he had ever met. He asked Jesus "How many times should we forgive? Up to seven times?" Peter had doubled and added one. Jesus responded "No not seven times, but seventy times seven." Then he told the story about the man who was forgiven everything but refused to forgive a man who owed him relatively nothing. Do you remember when Jesus taught His disciples how to pray? At the heart of the prayer were these words. "Father forgive our debts in the same way we forgive others their debts." Do you see a pattern? Jesus just forgives. He forgives before we ever ask. He forgives before we even know we need to ask. His boundless mercy is designed to awaken in us compassion. He modeled that holding onto bitterness is not His way. All you have to do is look at history and you will see that when forgiveness does not happen, war follows. It may be war between a married couple, between a parent and child, between one half of a family and another or even between nations. The story of the man who refused to forgive does not end well. It never does. It can't. Even if the king had left him alone his life would have been cold and bitter and would have spoiled the lives of everyone he touched. Tomorrow we'll explore why the king did what he did and what it says about God and why it makes forgiveness the only viable option for a better future. Yesterday we walked with Jesus to where Adam and Eve were hiding. They hurt Him yet He went looking for them, not to seek revenge but to initiate healing. Paul wrote in Romans that "while we were yet sinners Jesus died for us..." In fact we see Jesus on the cross, while the crowd is blood thirsty and screaming for His death, say "Father forgive them for they know not what they do..."
Have you thought through the implications of all this? Do you see why Paul calls forgiveness a test of obedience? To say we are following Jesus yet refusing to forgive is like saying we belong to Green Peace yet killing every tree and plant in sight. Every excuse I ever tried to use or heard others put forth for refusing forgiveness don't stand up next to the example of Jesus. He didn't wait until we asked. He didn't hold out until we said we were sorry. There were zero conditions for His offered forgiveness. The only people who will never experience His forgiveness are those who won't embrace it. I can be given money, stuff, etc... but it only benefits me if I take it. Not one person, no matter how evil their actions will be lost because of what they did. They will only be lost because they didn't accept His forgiveness or they accepted His but refused to extend the same forgiveness to others. Jesus is the Lamb of God who was slain for the sins of the whole world. Not one person is unforgiven.